A Monet water lilies painting sold for nearly $43.8 million on Wednesday while a Kandinsky fetched an artist's record $23 million as Christie's kicked off the auction season with a sale that saw many mid-level works failing to find buyers. "Nympheas," one of Monet's iconic water lilies from 1905, executed during his years at Giverny, had been estimated to sell for $30 million to $50 million, and just managed its middle range with a final price of $43,762,500 including commission. 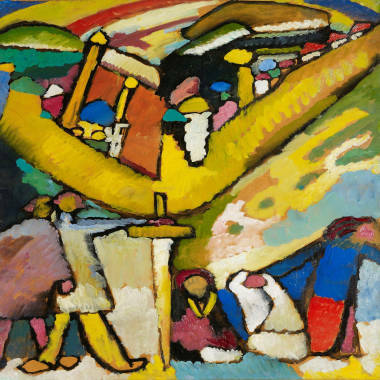 Wassily Kandinsky's "Studie fur Improvisation 8," meanwhile, hit the low end of its $20 million to $30 million estimate, and set a new auction record for the Russian artist. The vibrant work was being sold by Switzerland's Volkart Foundation. Christie's nonetheless said it was pleased with the results. Wassily Kandinsky's "Studie fur Improvisation 8." Lampley also noted that the sale's unusually high percentage of discretionary selling -- when collectors decide to sell, versus estate sales that happen because the owner is deceased -- was "very much a sign that collectors are feeling confident in the market. They are choosing to sell," which she said was a testament to the increasing strength of art as an asset class. Officials privately attributed the relatively high percentage of works that failed to sell -- nearly one third -- chiefly to a single collection whose owner was unwilling to lower the reserve prices in the days leading up to the sale. In all, six lots sold for more than $10 million each. Other highlights included Miro's "Peinture (Femme, Journal, Chien), which went for $13.75 million, and Picasso's "Buste de femme," and oil on canvas that at $13 million was one of the few works to beat its pre-sale estimate handily. The auctions continue on Thursday when Sotheby's holds its sale of Impressionist and modern art, which it postponed from Monday due to Superstorm Sandy which hit the region last week.